A special thank you to Organic Life for sponsoring the catering, your contribution and artful presentation were greatly appreciated. My new focus is on the medium of paint exclusively. which I am applying to my alternate bodies of work. Below is a glimpse into the inspiration and development of the TANTRA SERIES. Acrylic on canvas. 48" x 108"
Acrylic on canvas. 50" x 73"
The exhibition features the work of The Arts Club’s visual artist members, and continues The Arts Club’s long-standing tradition of, and commitment to, furthering the arts. Included in this exhibition will be locally, nationally, and internationally esteemed artists, working in a wide variety of media and a breadth of historical influences. The Arts Club of Chicago, established in 1916, was founded with the mission to expand the artistic horizons of a public interested in the arts and related activities, and maintains its public galleries, free of admission, to that purpose. Since its inception, and as a part of its mission, The Arts Club membership has included both professional artists and lay members. Throughout its history, The Arts Club has produced significant exhibitions of artists such as Pablo Picasso, Constantin Brancusi (installed by Marcel Duchamp), Jackson Pollock, Alexander Calder, Auguste Rodin, Peter Doig, John Baldessari, David Hockney, Sigmar Polke, Maya Lin, and Chris Ofili. Art Basel Miami is one of the most anticipated shows of the year for me -- and not only to escape Chicago's brutal weather! I am inspired by much of the work exhibited. It's always very interesting to me when artists reinvent their work and Keltie Ferris is a great example. She is a large scale abstract painter known for her powerful canvases charged with color. Around 2014, however, she took up a new approach: she began coating her body in linseed oil, using her body as a brush. Then, she layered deposits of color pigment overtop. These works filled her last show at Mitchell-Innes & Nash in 2015. Adam: This is the antithesis of seeing something on your phone. You hit it on the nose. This show is an aggressive invitation to be able to go back and actually see paintings in ways that people used to see in the 16th century, when you’d walk through a church and see a Giotto, and stained glass, and all in the context of an amazing cathedral. Today, you’d see a hundred people around you, just scrolling away on a screen, or aiming to take the right Instagram photo. How can you really connect with that? People need to be allowed to sit with art and understand its context. Thanks for sharing your story with us Adam. So, let’s start at the beginning and we can move on from there. I was fortunate enough to be raised within a family which lived and breathed the arts both architectural as well as fine arts. My father was hired to head up the new program for the Bauhaus photography department at the Institute of Design. Thus it was not uncommon to engage with the great architects and artists of the times at the dining room table- Saul Bellow, Harry Callihan, Larry Booth, and Edward Westin. I learned from monitoring these creative exchanges that to be in the arts was best facilitated by an embrace of both courage and humility. With photography in my veins I had immediate artistic commercial success with large-scale experimental photography early on in my career and from there I took a blind leap into painting. I synthesized and integrated my personal experience of living in Japan for a couple of years integrating those experiences into a personal aesthetic that fused both east and west and contemporary and historical. My library echoes my trajectory focusing on both European and Asian rare books from the mid- 1600’s to the early 1800’s. These visual treasures provide fertile breeding grounds for my evolving bodies of work. Overall, has it been relatively smooth? If not, what were some of the struggles along the way? I don’t think a life in the arts is meant to be a smooth road. There’s a bump every time a blank canvas is staring at you. That’s why I’ve chosen this path. It’s because of the constant challenges that keep me excited about the next creative environment. I’ve always found that the most challenging space is to focus all my energies on what is essential and whether or not the work is relevant beyond my own sphere. The most challenging aspect of being an artist has been how to disengage from the process long enough that I can restore myself before I return to my creative world. CGN: You started to talk about technology andWabi-Sabi. How did the series come to be? Can you explain more about technology aspect? Adam: On a trip to an old girlfriend’s country house in Wisconsin years ago I brought a stack of letters purchased from an antiques store written in Germany in the 1920’s. I get to this atrium in the house and open a letter up and it was written in Yiddish, which is a mostly dead, written language. I looked at it and out of nowhere I took a white candle, I drew a 3⁄4 profile of a woman’s face along the quadrant of the axis of the fold. Working blue watercolor over the wax drawing, a face emerged. That launched a 15-year run of works on paper called Works on Words, where I was interacting with antique manuscripts. That work hit a chord among a wide audience and the collecting community. While showing one year with the Thomas McCormick Gallery at Art Chicago we sold over 25 of these works. It was crazy I was running back to the studio at night making and framing these pieces and delivering them all in the morning in order to keep pace with the demand. After 15 years of developing these small collages, I eventually developed them larger in scale. Later on in the development of these works I began incorporating collage elements such as natural history - butterflies, birds, flowers, dogs, lions, tigers, and bears. Such a thrill to see the RNDD Fall Gallery Walk and my exhibition included in Sophisticated Living's spread! My latest exhibition has been a lifelong journey and I am so grateful for everyone who has already taken the time to experience it. Wabi Sabi: Portraits in Evolution is on exhibition at The Golden Triangle for an extended length of time. There are 34 works in the series and I encourage everyone to stop by. I would love to provide you with a private, guided tour. Please contact me to make arrangements. Two Tone. 4' x 9'. Day Into Night Series II. 5' x 8'. As a featured artist for the River North Design District (RNDD) Fall Gallery Walk, a special celebration and program is planned for the opening night of Adam's solo show in collaboration with Vosges and The Golden Triangle with an exclusive ticketed after-party from 8-10PM. To attend please purchase your tickets in advance here, space is limited. Proceeds benefit The River North Design District and support their programming throughout the year. On September 8th I will premiere my exhibition From the Wabi Sabi Series, Portraits in Evolution at The Golden Triangle. As a featured artist for the River North Design District (RNDD) Fall Gallery Walk a special celebration and program is planned for the opening night of my solo show in collaboration with Vosges and The Golden Triangle. My new work will be unveiled during an open house from 4-9PM September 8th with an exclusive ticketed after-party from 8-10PM. To attend please purchase your tickets in advance here, space is limited. Proceeds benefit The River North Design District and support their programming throughout the year. Exclusive ticketed after-party from 8-10PM, $25. 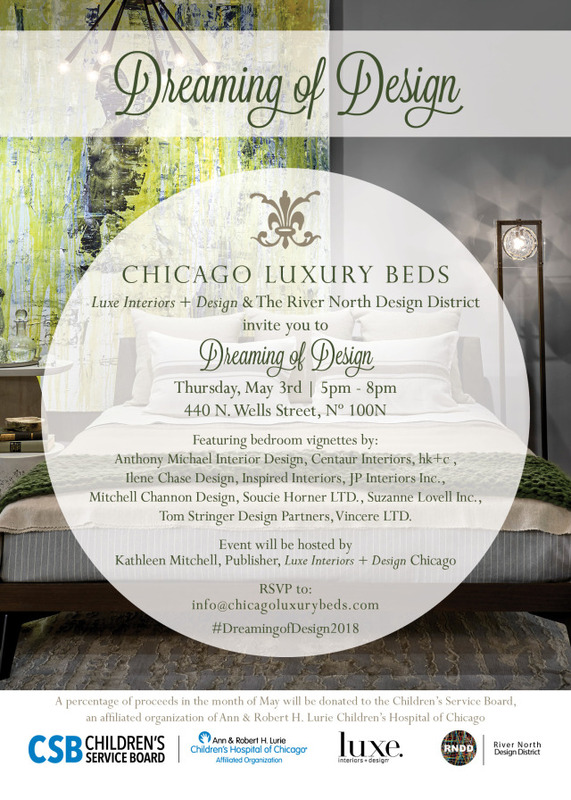 Proceeds benefit The River North Design District. Last month I stole away to Italy with my family to experience le dolce vita and collected inspiration for my new works. The Works on Words series, featured in my one man show at the Spertus Museum, is continually evolving in the privacy of the studio. I've had the great honor to collaborate with so many talented individuals in the culinary and design worlds. Congratulations to Roister on being featured in this past month's issue of Hospitality Design and in Chicago Magazine! It was an absolute pleasure to work with the team at 555 International on the installation of the Boar's Head piece. I'm flattered to have one of my works in this amazing restaurant and for 555 to feature it on their homepage. Congratulations Roister on being featured in this month’s issue of Hospitality Design magazine - I’m flattered to have one of my pieces in this amazing restaurant. It was an absolute pleasure to work with the team at 555 International on the installation of the Boar’s Head piece. Here’s to continued success! The Palimpsest series is a sustained exploration of the beauty and truth that is abundant in our natural world. The series reveals the simple and innate elegance of nature by magnifying historical observations and renderings within a contemporary context. A small collection of inspiring moments captured through my lenses. 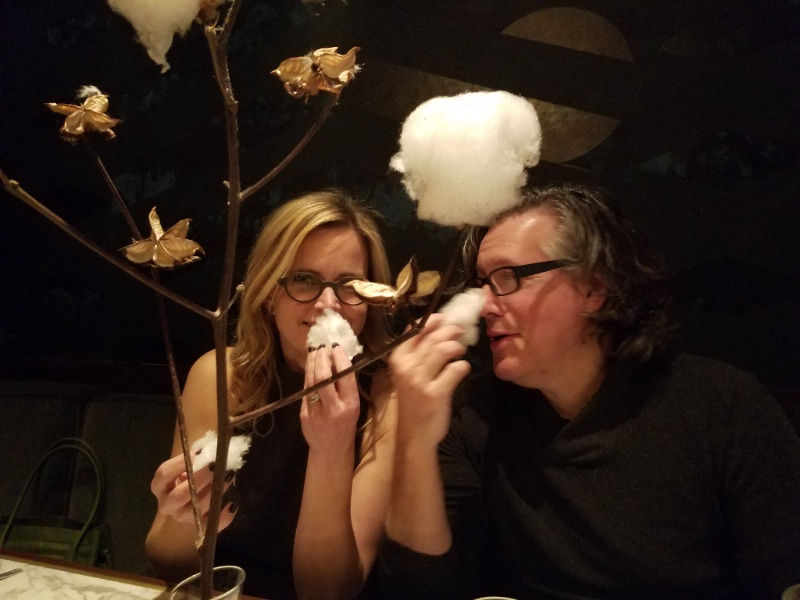 Last year I had the great pleasure and honor of incorporating the Palimpsest series into an unique dining experience that paired my art with the culinary genius of Alinea chef Grant Achatz. The experience of The Progression [ a pop-up in Fulton Market ] that Grant created was about breaking boundaries in terms of texture, palette, and color. My art is also about breaking boundaries. I created 24 unique works, including two large murals and a series titled Circular Moments. I'm very pleased to be featured in the newly released 2017 Arts Guide, by Chicago Gallery News, which highlights the incredible art being produced this year in Chicago. This city is a cultural inspiration and I'm privileged to call it my home! I'm thrilled to release a new collection of work added to my exhibition at the The Golden Triangle. My most recent works from the Ohm series are now on display. the ohm series refers simultaneously to cellular, binary and planetary organizational systems. The main them explores and makes visual the idea of life's infinite abundance as seen through variation of a simple circular form. 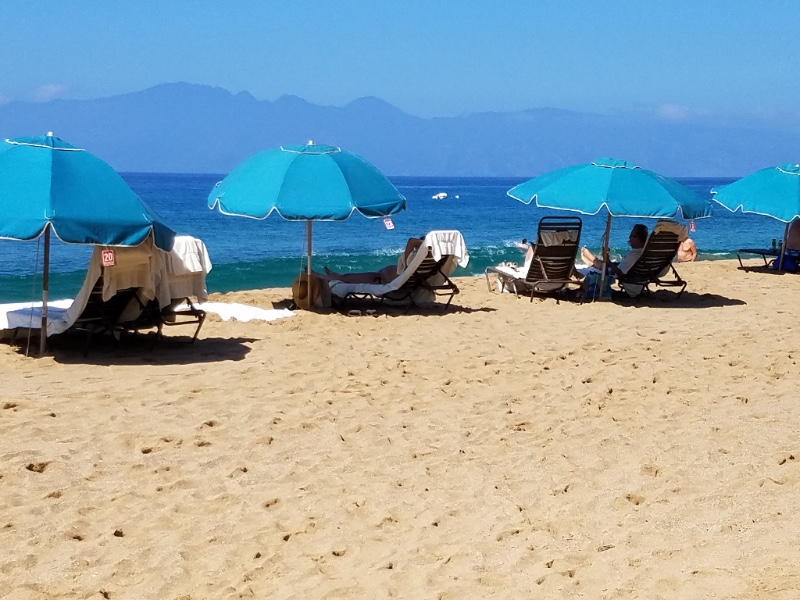 Photographs from my recent trip to Hawaii where I relaxed, refreshed, and collected inspiration for my Two Tone series of paintings. I'm delighted to share recent press placements in Hospitality Design, Sophisticated Living, and Chicago Gallery News. Art Basel is a credential for collectors and curators alike. Over the past decade, the art-fair scene has exploded on an international level as North America’s most anticipated fair. Pictured above, Gemini G.E.L. 's booth at Art Basel, a favorite featuring work of artist Richard Serra. Shapiro's reductive geometric forms are imbued with a humanized ethos that I find fascinating. Bill Traylor is my favorite artist of all time. He walks the delicate line between abstraction and figuration with a timeless sensibility grounded in the most humble materials. Combining vintage papers with broken geometries is a shared love of mine. The written word acts as a "sgraffito" to form a palimpsest with the intentional grid on top. Three dimensional forms fight to unify themselves on the picture plane animating a humble palette. A designer that acknowledges the truth of natural forms has a good chance of keeping his work timeless. Artist Adam Siegel employing small geometries to narrative affect. We are delighted to share with you recent works and happenings in the inaugural launch of Adam Siegel's Sketchbooks. We look forward to hearing your feedback and hope to see you soon in person or online! So proud and honored to share some recent press placements in Chicago SPLASH, Sophisticated Living, Crain's Chicago Business and Chicago Gallery News. Special thanks to our media sponsor, Chicago Gallery News. 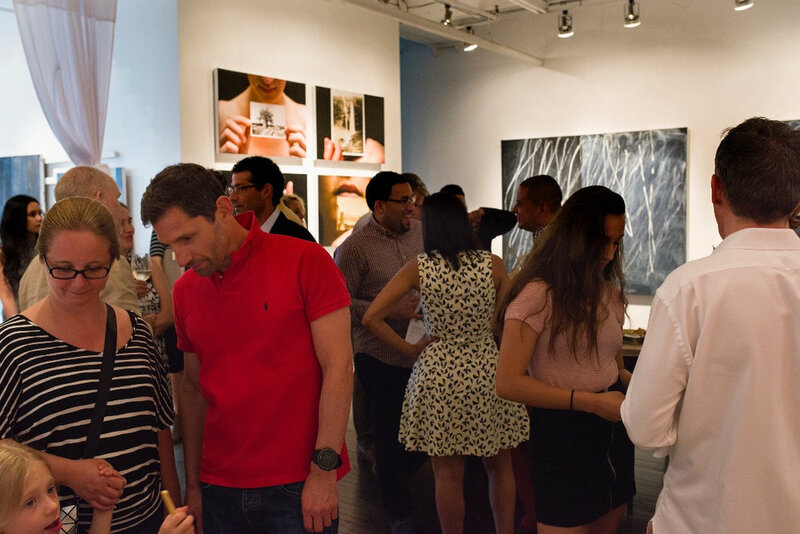 On September 9th The River North Design District kicked off their annual Gallery Walk with Adam Siegel's exhibit at The Golden Triangle, peruse some of our favorite event photos and thank you to everyone who came out to celebrate! Adam with two new collectors. 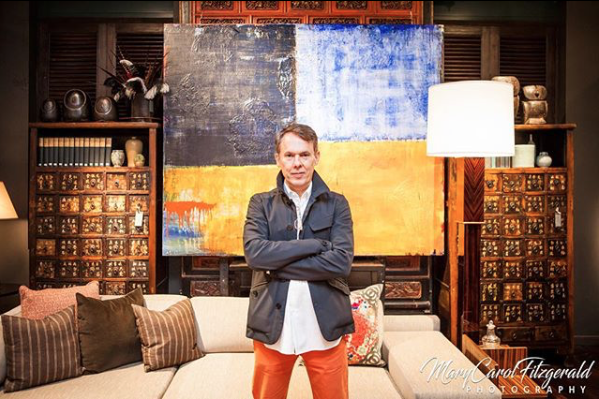 29 new contemporary works in an 18,000 square foot environment at The Golden Triangle, a Chinese Colonial like mansion showcasing both contemporary and ancient works of art and furnishings. About The Golden Triangle: Originally a store for imported collectibles from Thailand, The Golden Triangle has since grown to an 18,000 square foot design destination. For more than 27 years, owners Douglas Van Tress and Chauwarin Tuntisak have hand selected vintage and modern furnishings from around the world. Assembled in curated vignettes, the store boasts an eclectic mix of Asian and European antiques, artifacts, lighting, and other accessories. From designers and trade professionals, to collectors and simply curious shoppers, The Golden Triangle welcomes all individuals with an interest in design and appreciation for beauty. Cultural events are regularly hosted by the store highlighting: global and local design, inspiring artisans, Eastern and Western art, philosophy, history, tradition, and new collections. Chicago artist Adam Siegel is nationally recognized for his breadth of work as an abstract painter and photographer. Fusing iconic forms with texturally rich color, Siegel constructs his large paintings and photographs in multiple layers that immerse the viewer into a meditative space. Inspired by his personal collections of 18th century works including Japanese kimono designs, natural history illustrations, and quixotic manuscripts he uses new technology alongside collected imagery. His works bridge new to old, high to low, reverie to the achingly simple. For more information and Siegel's full bio please visit,www.adamsiegel.com. 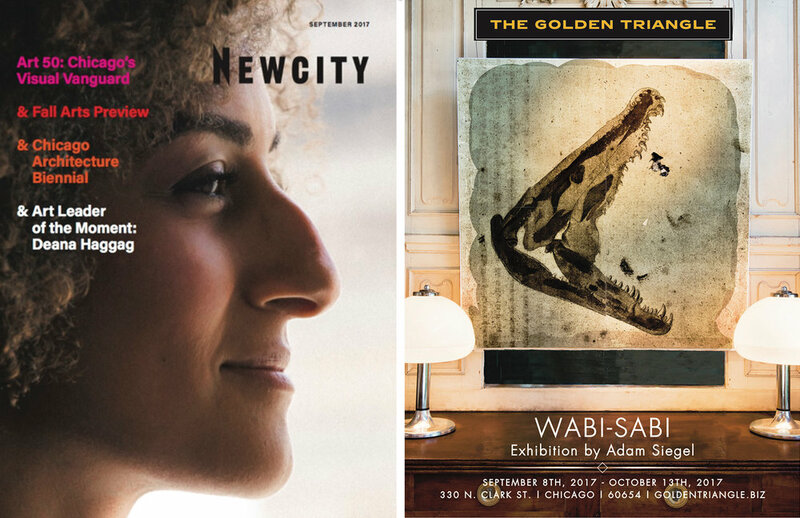 Adam Siegel selected to kick off the 2nd Annual River North Design District Fall Gallery Walk, September 9th at The Golden Triangle. On exhibit from September 9th thru December 9th. The River North Design District is kicking off their annual Fall Gallery Walk on Friday, September 9th 2016 at the Golden Triangle featuring new works by Adam Siegel. The event’s host committee includes art enthusiasts and collectors Candace Jordan, Nina Mariana, Ignacio Valero, Aimee Wertepny and Donna Hall Mondi. Each participating showroom will be exhibiting artwork created by some of the brightest stars in the art world today. Showrooms will have extended hours during the event until 9pm. The works will be exhibited until December 9th. Please visit https://rivernorthdesigndistrict.com/2016-fall-gallery-walk/ for more information. A few photos of The Golden Triangle's fabulous space. Collaboration with The Cara Program. *A portion of sales for the entire month of July will go to Cara – helping adults affected by homelessness and poverty to access hope, jobs and opportunity. Cara was named by Chicago Magazine as one of the city’s Top 20 Standout NonProfits to Support this Season for 2015 and was selected as the 2015 Social Innovator by the Chicago Innovation Awards. Please visit, thecaraprogram.org to learn more. New Work. New Website. New Connections. Artist and photographer Adam Siegel was asked by The Alinea Group's James Beard recipient Grant Achatz and his business partner Nick Kokonas to collaborate on two projects The Progression and Roister. Siegel has created a new body of work which includes 25 pieces. The Progression is a melding of theater, art salon, and restaurant in a spontaneous, unedited improv dining experience located within the former Moto space and next door to Roister. The pop up concept by The Alinea Group is a multi-dimensional journey through different spaces where food and art intersect. "Love Under the Midnight Sun" by Siegel installed in The Progression's casual dining space. Left: "Atlas Moth" by Adam Siegel, each installation is 28'w x 11'h. Siegel is also a photographer, and he created a special series of 12 limited edition prints and two artist proofs for The Progression located in the formal dining room. His photos are a study in opposites. Juxtaposing color with black and white, female with male, youth with age, the privacy of the body with the openness of public space, the new with the old—these photographs orbit the idea of time, how we circle around the past in an effort to reabsorb it into our lives with new meaning. Chicago artist Adam Siegel is nationally recognized for his breadth of work as an abstract painter and photographer. Fusing iconic forms with texturally rich color, Siegel constructs his large paintings and photographs in multiple layers that immerse the viewer into a meditative space. Inspired by his personal collections of 18th century works including Japanese kimono designs, natural history illustrations, and quixotic manuscripts he uses new technology alongside collected imagery. His works bridge new to old, high to low, reverie to the achingly simple. For more information and Siegel's full bio please visit, www.adamsiegel.com.